The full name of our car, which was christened by Flynn, is “Valvados, Evil Dragon King and Traitor to the Cause.” Or something to that effect. Well, we certainly feel betrayed at the moment. This morning we set out from my parents’ place, full of hope and optimism, to come spend the day with Mary and Jordan. There was a little hesitation in getting the car started, but eventually it settled down and we made it to Mary and Jordan’s apartment in Nashville without incident. Since Mary didn’t get off work until 1:00, I had arranged to meet my cousin David’s wife Julie for lunch. The place we agreed to meet was near Vanderbilt, so I was able to drop Jordan off for his class before going on to meet Julie. We had an enjoyable lunch, during which I ate what I believe is my first bison burger (without the bun, obviously). The trouble started when I tried to drive back to Mary and Jordan’s. I won’t bore you with the details, but suffice it to say that I was praying hard all the way and wondering if I would end up having to walk back to the apartment. It was one of the most stressful drives of my life. We tried at least seven times to start the car. So I had to check the transmission fluid illegally, and the good news is that there is transmission fluid to be checked! Then Walter wanted me to check the battery connections. Strong and solid. So what I have is a large piece of peeling blue junk that won’t go and we don’t know why. We were supposed to be on our way home to Texas tomorrow. At least we got to hang out with Mary and Jordan this afternoon and evening. And, we will see more of them tomorrow since we apparently won’t be going anywhere . . .
My dad was gone at church all day (he’s a pastor) so the kids and I slept in and had a late breakfast. It was very cold so outdoor activities really weren’t an option. 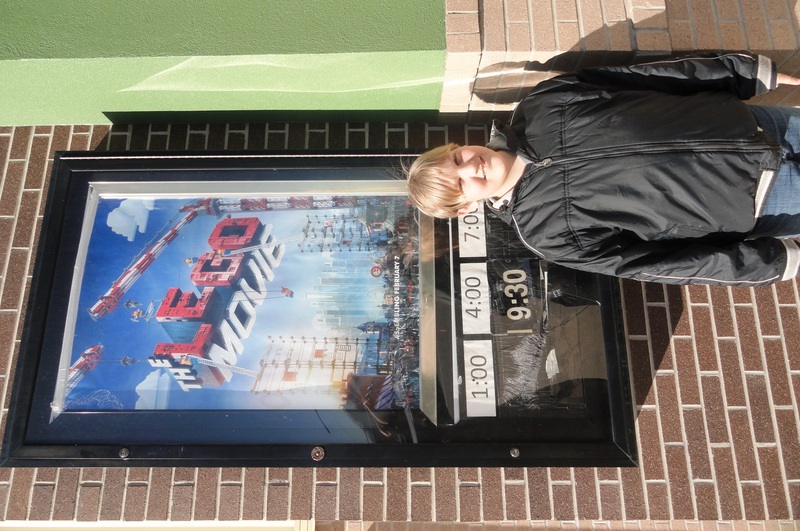 Eventually we decided to go to a movie after lunch, and the only one playing that was something the kids really wanted to see was “The Lego Movie.” In 3D. 3D is not my favorite, but we didn’t have a choice, so off we went. My mom stayed home to nap so it was just the three of us. It was a cute movie. I was very sleepy, and I found it hard to care about Lego people, but Jasper did not have this problem! He loved it. And lots of tea, most of it Asian in origin. 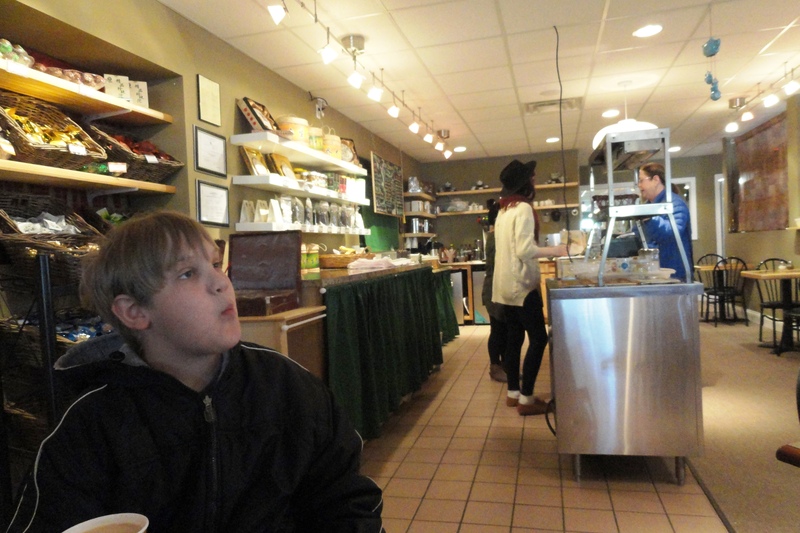 Everything was very reasonably priced so we each got some tea and a snack and it was very enjoyable. Then we came back to my mom’s house and enjoyed some comfort food for supper. We’ve enjoyed having a little extra time with my parents and are looking forward to seeing Mary and Jordan tomorrow. 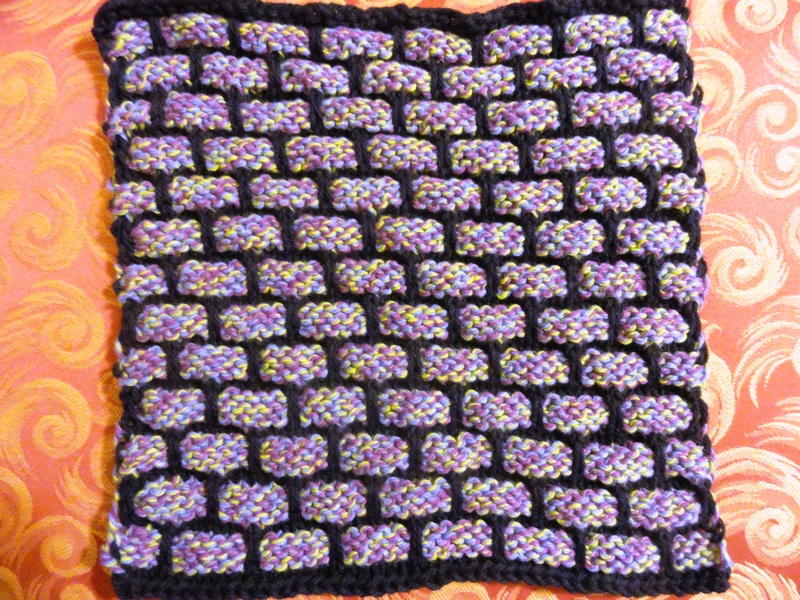 Now I’ve started on a new dishcloth. This is the most knitting I’ve been able to do for months! Today I got up, took a shower, and then sat down to a fabulous omelet breakfast courtesy of my dad. Jasper had already been up for some time. Later in the morning, my mom and Lucy and I set off on a shopping excursion. The whole point of the excursion was to find a jacket of some kind for Lucy, because the weather is turning cold and it never occurred to Lucy that she should bring a jacket on a trip in February. My mom hated for me to have to buy a new jacket, even though they are on sale at this time of year, so she decided we should go to a couple of thrift stores first to see if we could find something suitable. Her reasoning was sound, but the reality is that we walked out of both thrift stores after buying multiple items that we never would have even seen if we had gone to Walmart in the first place–and we still didn’t have a jacket for Lucy! I’m not complaining, mind you–but I do find it amusing. Lucy found some articles of clothing that she really did need, and they were marked way down even for thrift store prices. I found a few things also, including four more glass punch cups, which I am always looking for. Then we did get to Walmart, where we found a hoodie and a cardigan on sale. If she wears both layers, I think Lucy will be able to stay warm for brief periods outdoors. We still had time before our lunch rendezvous, so we went on to the yarn store, where I showed superhuman restraint, which was not in any way related to the fact that I had just spent a bunch of money I hadn’t planned on. I did only buy two patterns and I thought that was very noble of me. My dad and Jasper met us for lunch at a Chinese restaurant where we all ate too much. By “all” I mean my kids and me. Then it was on to Kroger to buy some gluten-free bread, since Stephanie’s dog had eaten the gf bread I carelessly left on the counter in Atlanta! I also splurged on some gf cinnamon rolls which I really hope are as good as they look. Every last one of us took a nap this afternoon. Jasper also spent some time outdoors and a LOT of time listening to his audiobook. Tomorrow we were supposed to drive to Nashville and spend the day with Mary and Jordan, but since Mary is working for most of the day we wouldn’t actually get to see her, so we have changed our travel plans. We’ll stay here another day and hang out with my mom, and then go to see Mary and Jordan on Thursday. I don’t mind being here another day. I love this part of Tennessee. Today is special, because my husband was born on it. Unfortunately, I am not at home to share this day with him, but I understand that Mercy did a great job of making him a special dinner and we will have a family celebration sometime after my return. Yesterday, as you know, we went to church with my mother-in-law. We were joined by Mary and Jordan and their friend Justin. After the service, my MIL had arranged for us to have lunch with her and her smallish group at the church. It was very interesting for a church dinner in that all the options were vegetarian. Thankfully many of them were also gluten free! After lunch, Mary and Jordan had to head home to Nashville. They took Jasper with them and dropped him back off at our hosts’ home so that he could go to Jo’s lacrosse game. Lucy and I went to my MIL’s house and spent the afternoon with her. We even got to see some of the Olympics (the only Olympics coverage we saw at all). Then she took us to her favorite Chinese restaurant before we headed back to the house where we were staying. It was a good visit. Today I got up earlier than I would have chosen, but I had a good reason. I was meeting Rebekah for breakfast. Rebekah is the older sister of Ruth, whose wedding was on Saturday. So today I had an all-too-brief visit with Rebekah before she had to go shopping and I had to rush back to the house to pack so we could leave before Stephanie left on a lunch date. The drive up here to my parents’ house was stressful and took five hours instead of four. First there was Atlanta driving. Then there was the fact that I was blindly trusting Delilah (my GPS), and she is not always trustworthy. Like the way she made me drive through downtown Chattanooga for no good reason and then made me drive in a big circle three times because the exit she insisted on me taking no longer exists. Finally I just ignored her and kept driving and sure enough I ended up on the right road anyway! Despite the frustrations it was a gloriously beautiful day without being too warm. We got to my parents’ place late afternoon and gained a whole hour since they are in the Central time zone. The kids walked to the lake and even got their feet wet in the very cold water. We had a great dinner and the kids got to watch a movie and talk to the birthday boy on the phone while I visited with my parents. It’s good to be here. This morning we went to church with my mother-in-law. The church my mother-in-law attends is more than 100 years old (as a congregation) and still thriving. This is the same church that my husband and I attended 30 years ago during the two years that we lived in Stone Mountain. Every time we are able to go to a service at this church, it feeds my soul so much more bountifully than it is wont to be fed. There is a glorious pipe organ that is put to glorious use. There are choirs singing beautiful, traditional music with soaring harmonies. And there is a congregation large enough to make singing traditional hymns a soul-stirring experience. This morning as I joined my voice with hundreds of others to praise God, I thought of something our host, Ted, said the other day. I had told him how much I was looking forward to the organ and the congregational singing, and he said, “Everyone should get to experience worship in the way that is most meaningful to them.” On the one hand, it makes me sad that Christians are now so divided by worship styles that there is no longer a common “worship language” that is understood and appreciated by all people who worship the same God and believe the same doctrines. There have been times that I have deeply resented those who have tried to force me to conform with their definition of “worship,” as if there is only one valid way to do it. And usually, that way involves a noise level that inspires me to anything but worship. So this morning’s service was a beautiful and hopeful and inspiring reminder to me that there are still congregations in this world that relish the reverent and more traditional worship that expresses my own deep feelings for my Savior. This is a vibrant, alive congregation with old folks, middle aged folks, growing families, newlyweds, singles and kids. Lots of kids. It makes me so happy to think that at least in this one place, kids are being raised not just to know but to love the great hymns of our faith. This is one of the hymns we sang this morning. Tender Spirit, dwell with me! Mighty Spirit, dwell with me! I first met Ruth in Colorado, the first day of the first “Moot” that I took Flynn, Mary and Mercy to in 2008. Ruth introduced herself to me, and it eventually dawned on me that she was one of the “Ferns” I’d heard so much about. She was actually the “younger Fern” with her sister Rebekah being the “elder Fern.” I learned that she’d been secretly reading my blog. She was a fellow knitting enthusiast, having learned how to knit recently but already very accomplished. Over the years Ruth has been an encouragement to me. She read and critiqued my novels–and then proofread and edited them for me. She appears to have the Chicago Manual of Style written into her DNA–one of her many endearing qualities. She has been a staunch and loyal friend to Mary. She and her sisters helped us pull off a great graduation party for Flynn when he graduated from college. She made me a beautiful and delicate shawlette that I love to wear. Her family’s home has become a second home to us when we are in the Atlanta area. It is a haven of peace and kindness. Ruth also helped me with two of my biggest sewing projects–the Technicolor dreamcloak for Mangy and then of course Mary’s wedding dress. She is a “detail” person and she is one of the very few people to whom I am willing to delegate tasks that I would normally insist on doing myself. So when I heard the happy news that she was getting married, I really, really hoped that we would be invited to share this special day with her. I knew it would be a small wedding so I made no assumptions. I felt very honored to be included and I just wish that more of the family could have been here today. Mary came down from Tennessee to photograph the wedding, and with the three of us who came from Texas that made four of our family (five with Jordan who arrived late). I had never met Ruth’s Jordan until yesterday, but it delighted me to see them working together as a team. 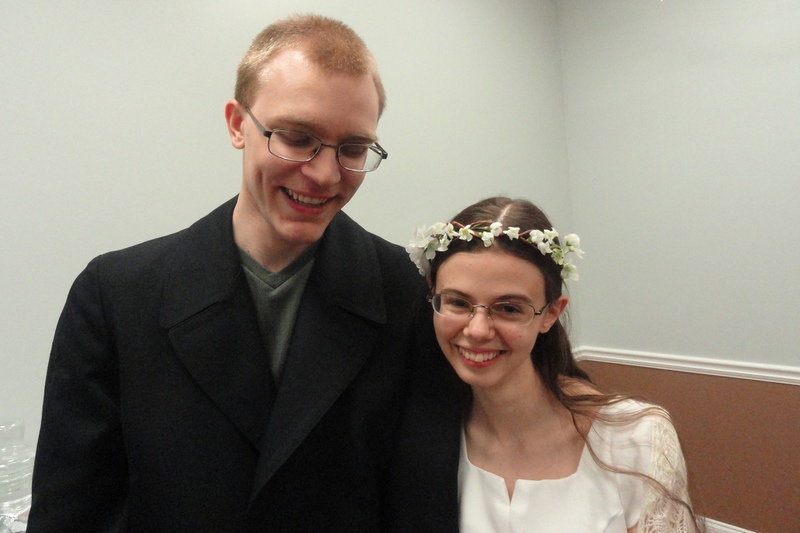 The wedding today was small, simple, sweet, intimate, profound, and happy. Ruth wore a dress she had made herself, along with a stunning wedding shawl she had knitted. Sonya (Ruth’s mother) played the piano as John (proud dad) walked her down the aisle. There were no attendants–just two young people and the minister standing there before God and surrounded by people who loved them dearly. I remained dry-eyed until the parents stepped forward to surround their children with both their arms and their prayers, and the rest of us were encouraged to pray for them too. After that I don’t think there were many who were still dry-eyed! Sonya fetched some tissues and offered them to the bride and groom! Afterwards, we stayed to visit with friends and family and to enjoy the excellent buffet, all of which was gluten free–including the brownies which I had decorated yesterday. We didn’t see much of Mary due to her photographer duties, but at least we caught a glimpse of her from time to time. Oh, how I’ve prayed today that God would bless this young couple! Friends since childhood, they are now joined together to form a new family. I had a gloriously restful night of sleep last night, here in Stephanie’s divinely cool basement. It was raining for most of the night, and every time I woke up briefly I heard the rain falling and that made me feel even more cozy. I had no responsibilities this morning, so I had a leisurely breakfast and then after Stephanie took Lucy and Jasper to go have lunch with her kids at their school, I stayed at the house and took a shower and maybe a little nap. This afternoon I went over to the home of our dear friends the “Ferns,” whose daughter Ruth is the bride who is getting married tomorrow. I was hoping to be of some use in the wedding preparations, but of course they are so very organized that there wasn’t much for me to do. The one thing they wanted me to do was to do some kind of icing decoration on the brownies which they will be serving instead of traditional wedding cake. Rebekah had made the icing, and they had some icing tips and couplers, but they did not have any bags, so they had set out a couple plastic freezer bags for me. I carefully cut a corner off and inserted a coupler, only to have the bag split at the seams. This situation required a little bit of thought. I sent Ruth in search of some packing tape and she was able to find enough for me to reinforce another corner of the freezer bag and this time when I inserted the coupler the bag held. The next problem was that the tip I wanted to use had several prongs that were bent in too far. Fortunately I was able to find a suitable ball point pen and straighten the prongs out. After that decorating the brownies was quick and easy! Then Mary (my own sweet daughter) approached me with a skein of yarn and a crochet hook, and wanted to know if I remembered how to crochet well enough to crochet a chain for her to use in making a banner. Well. It’s not like I don’t know how to crochet or would ever forget. I just prefer knitting to crochet by a large margin. So, I crocheted a chain and then spent a fair amount of time untangling yarn. Then Mary and I went to the church with Ruth and Jordan (the groom) to see the set-up and so that Mary could get an idea of the lighting and photo angle possibilities (she is photographing the wedding). After that there was nothing left for me to do, so I put gas in the car, picked up a few gluten-free items at the grocery store, and came back to a delicious spaghetti dinner with Ted and Stephanie and their kids. Stephanie had even gone to the trouble of getting gluten-free pasta. Jasper is in heaven getting to hang out with his friend Josiah. 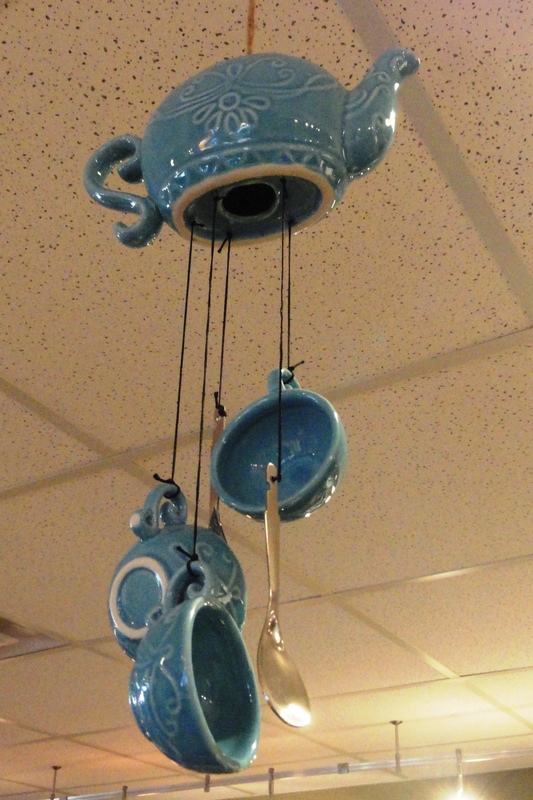 I am so glad for generous friends who are willing to put us up! So, yesterday I was in the car, driving, all day long. We left shortly after 7:00, despite the fact that I had a horrendous night of almost no sleep. I hate starting out tired. Anyway, I had some rather foul tasting chai that I had made with almond milk, and I made myself drink it because I needed the caffeine. I did pretty well until lunchtime, and I was a little concerned because I normally take a short nap after lunch and here I was already tired but I had to keep driving. Now as one who has fallen asleep at the wheel and driven into a tree and been injured, I do not shrug off the dangers of drowsy driving. No schedule in the world is worth dying for. Shortly after lunch I realized I was in serious trouble. I drank a caffeinated beverage but it didn’t seem to help. I began praying for a rest stop to appear. Finally, we reached a rest stop and to my delight it was the kind that has a separate picnic area with covered tables and a separate pull-in spot for each table. I pulled in and told the kids that they could sit at the table and watch a movie on my portable DVD player while I reclined in my seat and took a nap. I set my timer on my phone for 30 minutes and passed out. I couldn’t believe how refreshed I was when I woke up half an hour later. It did me a world of good. We got back on the road and I felt like a new woman. I’m not saying I didn’t need any more caffeine after that, but I was able to stay focused through some very stressful driving and very heavy traffic from Tuscaloosa all the way to and through Atlanta. I drove almost 700 miles and it took me 15 hours. That is a new record for me. I’m sure you can imagine how happy I was to be greeted at the door by a smiling Stephanie! We saw two things of note during our travels yesterday. The first was a pickup truck with its engine on fire. It wasn’t a tentative sort of fire either. It was a raging inferno and the two former occupants were actively fleeing away from it! The second thing was that Lucy saw an alligator sunning itself in some wetlands beside the road in Louisiana. That made her whole day! I, meanwhile, misread a sign which made me chuckle. There was a sign that said, “Caution. Survey Crew.” But since I was driving, I barely glanced at it and I thought it said “Caution. Scurvy Crew.” I couldn’t help thinking of those piratical surveyors and when I actually saw them I cracked up. My priorities have changed rather drastically since the weekend. This weekend my husband realized that he was not going to be able to travel to Georgia with us this week after all. I had been so excited about him coming for many reasons, one of which was the fact that he’d be doing the driving and I would not. The trip to Tennessee in the fall just about did me in. So, suddenly my focus changed from “finish as many craft/sewing projects as possible” to “get as much sleep as possible because it’s a long, long way to Georgia.” Unfortunately, the sleeping hasn’t been as plentiful as I had hoped, because we still have to do school and I still have to teach. I scored a great deal on overripe bananas on Sunday, so today I made a big loaf of gluten-free banana bread. I intended to make it for the whole family, but once Lucy and I tasted it we found that we were not actually willing to have it disappear so quickly, so I had her make a second loaf of “normal” banana bread! I rarely get a treat like that so I really enjoyed it. Considering that sleep is my top priority at the moment, I think I will go see if I can find some . . .
Today was pretty boring. We did school. I did some housework. I called my mom. This evening I went to a graduation meeting with Spencer. Then I came home and spent two hours trying to get on the internet. Now I’m behind with my class preparations. That is all.